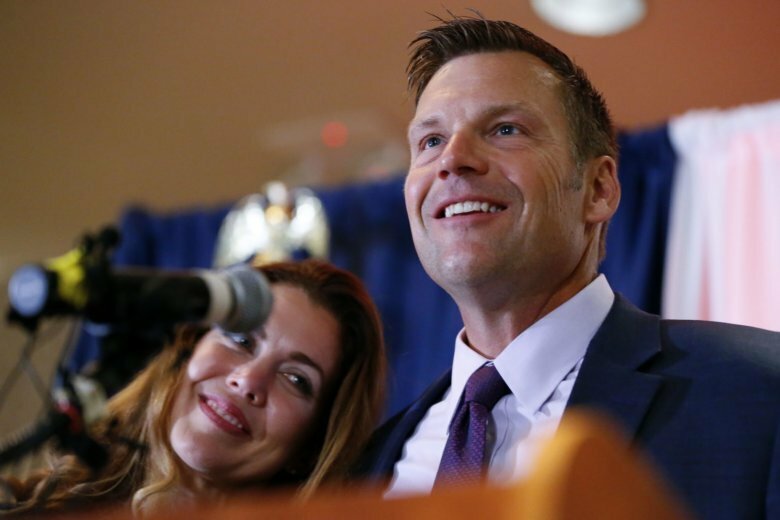 TOPEKA, Kan. (AP) — Kansas Secretary of State Kris Kobach stepped aside from his duties as the state’s top elections official Friday until his hotly contested Republican primary challenge to Gov. Jeff Colyer is resolved, but Colyer argued that Kobach still has a conflict of interest because Kobach is handing his responsibilities to his top deputy. Kobach rejected Colyer’s accusations that the advice he has been giving local elections on handling ballots violates state law. And the secretary of state — who has boosted his career by extrapolating scattered cases of election irregularities into claims of a serious election fraud problem — chastised Colyer in a letter over statements that, Kobach said, could undermine public confidence in the state’s elections. Colyer had demanded in his own letter Thursday that Kobach stop providing guidance to county officials as they counted late mail-in ballots from Tuesday’s election and prepared to count other ballots next week. Kobach’s duties will go to Assistant Secretary of State Eric Rucker. Colyer was pressing Kobach to have state Attorney General Derek Schmidt advise county election officials — something Kobach argued isn’t allowed by law. Schmidt already is anticipating the possibility of a lawsuit challenging the election results by Colyer or Kobach and sent a letter to county election officials, reminding them to preserve “any paper files, notes, or electronic data related in any way” to the election. Updated totals with late mail-in ballots from all 105 counties counted left Kobach’s lead over Colyer at 110 votes out of more than 313,000 cast, less than the 191 votes recorded the morning after Tuesday’s election. Under state law, mail-in ballots are counted if they were postmarked Tuesday and arrive in county election offices by Friday. Kobach is a conservative lightning rod who alienates even some fellow Republicans, but he is perhaps President Donald Trump’s closest political ally in Kansas and had Trump’s tweeted endorsement. Colyer, backed by the National Rifle Association and a strong abortion opponent, is trying to avoid becoming the first Kansas governor to lose a primary since 1956. The winner will move on to the November general election, where state Sen. Laura Kelly, of Topeka, is the Democratic candidate. Colyer has accused Kobach of giving county election officials guidance “not consistent with Kansas law,” and said Friday on Fox News that he was worried that some mail-in ballots were not being counted as required. In addition to counting mail-in ballots, county officials must review nearly 9,000 provisional ballots, given to voters at the polls when their eligibility is in question. The counties have until Aug. 20 to finish. Colyer’s campaign on Friday announced plans to have representatives in all 105 counties when provisional ballots are reviewed. Kobach said Rucker also will serve on the three-member state board that will certify the primary’s final results by Aug. 31. Colyer is also a member of that board, and Kobach called on him to let Lt. Gov. Tracey Mann serve on the board instead. Colyer did not say whether he would do so. Kobach is a vocal advocate of tough voter identification laws and served as vice chairman of Trump’s now-disbanded election fraud commission. He publicly backed Trump’s unsubstantiated claims that several million illegal ballots may have been cast in the 2016 election, costing Trump the popular vote.